The Steering Committee of the EaP CSF appeals to EU Foreign Affairs Council, as well as the foreign ministers of EU member states – to act on the current situation, instigated by the crisis on the Azov Sea. “We encourage you to go to [Mariupol] and other parts of the South-East Ukraine […], to get a first-hand impression of the social security hardships caused by the conflict with Russia”, reads the appeal. There is a need for two-way action: targeted sanctions against entities responsible for the aggression and those profiting from its consequences, on one hand – and targeted EU support to the Azov region, to address “the economic damage caused by the de facto Russian blockade”, on the other. 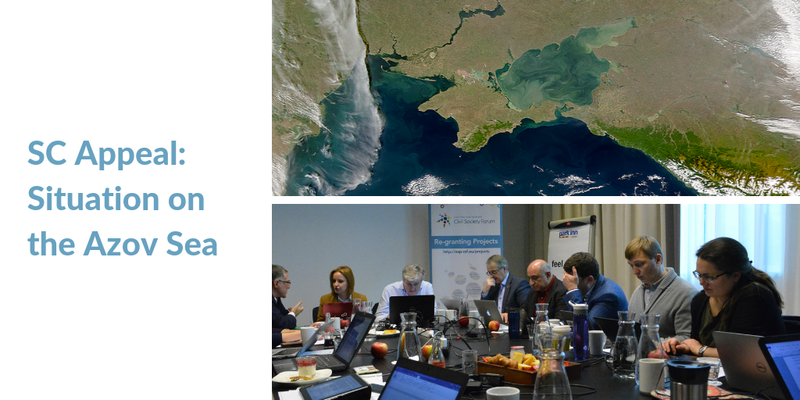 The Steering Committee is clear in its assessment: it sees the actions of “the Russian Federation in the Sea of Azov and the Kerch Strait as a breach of international maritime law and Russia’s international commitments”. It references the incident from 25 November 2018, and the treatment of 24 Ukrainian servicemen – pointing to their prolonged pre-trial detention, ordered by the Lefortovo Moscow District Court. The order is incompatible with international humanitarian law, we can deduce from the appeal – and the EU should use its external instruments to put pressure on Russia for their immediate and unconditional release as prisoners of war. The recent developments are indeed worrying: recently, we saw the illegal construction of the Kerch Bridge – and Russia continues a policy of “selective access and arbitrary detention of Ukrainian and foreign vessels” on the Azov Sea. This is not without its consequences to the security, local economy or natural environment – Organization for Security and Co-operation in Europe (OSCE) Special Monitoring Mission already documented losses suffered by the Ukrainian port of Mariupol. In other words, the appeal reads as a call for action: the region needs EU assistance to prevent the current situation growing even worse. The timing is not coincidental – members of EU Foreign Affairs Council are due to “decide on the possible ways to discuss a comprehensive EU response” at their next meeting, scheduled for 18 February 2018.